Could you send me the Indigo log file? Please make sure that logging is turned on before opening the project though. I'm currently using Visual Studio and some free controls. For your information, I managed to create a new project with the same source files; and it re-opened the project file succesfully. However, when the program itself is closed and reopened, the "Index and length" error occurs again. I am an old user of blueIDE with DB Pro and I recently acquired AGK. Any chance that Indigo IDE will support AppGameKit also? At this point, no. I don't use AppGameKit, nor do I currently have plans to use it. Indigo was created as my own IDE for DBPro and is a hobby project of mine. If I do venture into AppGameKit, I may look at expanding Indigo. The AppGameKit IDE seems to look good. Though it is probably missing the additional syntax highlighting that Indigo has. The latest update corrects the project load and save issue. I did do a re-install of the system as well, so I am not sure if the computer caused any issues. All but the keystate tool is working well so far, I will continue to use it to see how well everything else works. That's great news. In doing some tests today I was able to replicate an error with the Keystate insert functionality. I also believe that I have a very simple solution as well. Which is to include the config file that I needed to create to prevent me from getting the error in the first place. All this time it wasn't part of the installer. And since it's already on my test machines I never noticed. I will hopefully have the latest beta ready for upload on Saturday. from the list with the mouse. much less useable for me :/, which is sad because it is so awesome. - It also effects the Intellisense when choosing from UDT-attributes. many of them the editor says nope. Been coding a bit lately, and was thinking of the Indigo "Extra" default relative path system. The problem I face is via the use of Dropbox on 3 different computers, all used at some stage during the week for DBpro. You can see that this project would work fine on Computer 1, but would fail when loaded on the other two computers. So at the moment, I'm struggling to get the Indigo "default relative path" to work, with my above work flow in mind. This latest demo should correct issues for both of you. Win32-Version: 10.0.30319.1 built by: RTMRel. Win32-Version: 4.0.30319.233 built by: RTMGDR. Win32-Version: 4.0.30319.235 built by: RTMGDR. Win32-Version: 4.0.30319.1 built by: RTMRel. Error translation by me: Object reference not set to an object instance. After that the loading process is canceled even if I press the continue button. This could be a very small problem and I guess it´s fixed rather easy, therefore I further tested intellisense with a new project but there´s still something broken. I doesn´t write the selected line, instead it writes the last line in the intellisense list apart from that it also adds the "ENDIF" for the unfinished "IF" and does a oddly placed return. This issue seems to occur only if I try to use it in an unfinished IF-Statement. It worked when I added the "ENDIF" first. Also the issue that the last entry in the list is selected just occured in this If-scenario. EDIT: It seems to occur with all loops, too. Except "FOR". If I begin a for-loop after writing "FOR" intellisense is closing automatically on this line ( maybe because there is no keyword left beginning with "for" ). EDIT: Also it fails to complete the "FOR", it doesn´t write the next by pressing enter if there is only written "FOR" ( I guess that´s because you expect a variable name to be there to add it to the "NEXT" command ). Repeat is working ( I guess that´s because you use the "UNTIL" for everything else, so the loop is already finished ). System.ArgumentOutOfRangeException: Der Index lag außerhalb des Bereichs. Er muss nicht negativ und kleiner als die Auflistung sein. Error translation by me: Index out of range. Same happens for a space after "case" with intellisense open. Interesting thing: "DOWNKEY" was the last entry in the intellisense list. Obviously it selected this instead of "DO" and added the "LOOP" for the "DO" ^^. Seems to be connected to the issue under point 1. EDIT: Actually it creates "DOWNKEYLOOP" no matter what I select from the list in this scenario -> I tried to select "DOUBLE FLOAT". Also the intellisense still closes after the keyword is finished, which is odd for me since I disabled the "Auto Case Fixup" ... I had some problems with that: It tended to scroll some lines through my code after I selected text to copy/paste. Because of that I often write my commands completely but still select them from the intellisense list just to have them capitalized. In 1.3.0 I wrote "if" -> intellisense still open -> then selected "IF" from intellisense and had my "IF" capitalized. In 1.3.1 I write "if" -> intellisense closes after writing "f"
Not really an error but somehow annoying to me XD. I would suggest an option whether the intellisense list should be closed or not. If you choose the list not to close it should only be closed if the user is pressing enter to select a chosen command. That would be awesome ... at least for me XD. PS: Sorry for swamping you in errors and issues ^^" ... I just want the editor to be the best it can be. For now I will stick with v 1.3.0. PS2: Overall there seem to be some problems with intellisense in combination with loops and ifs. Quote: "Sorry for swamping you in errors and issues ^^""
No worries. I appreciate the fact that you give examples. It's not helpful when people just say "it doesn't work". I can test your examples before posting the next beta. When you say "select" are you using the arrow keys or mouse? I will be adding an option to close auto-complete if you completely type in the selection. As well as make some adjustments to that functionality based on what you are describing. Quote: "When you say "select" are you using the arrow keys or mouse?" Yes Im using the arrow keys imo it´s much faster then mouse. Quote: "Yes Im using the arrow keys"
So that issue has been fixed. Hopefully you got my email Balid, regarding the strange Options window size. Not too sure what's causing this problem on my work computer, but since the Options window is static by nature, I can't resize it. When will it be fixed and the new download available??? I have been using the IDE alot over the past week. A few feature requests here; when there is time. Save All button; or menu item which saves all the open files including the project file. Sometimes when you add a new file to the project and exit; when you load the project back the added file is not loaded into the project. Also, when working with 50+ source files, saving 10 or 20 opened files one by one isn't ideal. Also, a Save Project menu item / or button. In line with the above issue, sometimes you need to change the compile order or a setting and need to save what you did to the project. Find (Ctrl+F) command; this is probably my most used tool in the IDE, it is really good, the project scope search and replace is a time saver; but it would be even better if it highlighted all of the text in the field. When you are doing a search in a selection; the entire selection may be a large function, this gets put into the textbox; it just slows down the workflow having to clear this unwanted text before confirming; rather than using the Ctrl+F > keystrokes > Enter routine. Again, it is a useful tool. Bloody brilliant!!! Will do some more testing over the coming days, but I think you've solved the multi-desktop library, different directory library problem! When you save, all open source files that have been modified are saved and if you made a change that would affect the project file then it is saved as well. Also, when you close Indigo without saving it should ask if you want to save. If a file has been modified and needs to be saved, it is marked with an '*' at the end of the tab name. I tested the process today and when I press save, it did save the project correctly. So I will watch out for the problem if it happens again and I will see if it is something I am doing wrong. What ever happened, took place after creating new source files. I did modify and save the source files on a number of occasions then closed the program. When I reopened the project, the newly added files were not included added. I found this out because of compiler errors based on an undeclared functions and arrays. I will do some more experiments of my own around adding includes both new and existing. The following is just a report of what may be related to my problem posted above. It may not be entirely to do with Indigo, but it may be a clue to what is happening. Sometimes the compiler creates more than one include of the same file. This happened three times this week. When I reload the project each time; everything is fine. When I look at the source code dump; the content of SF Text & SF Character Text were duplicated. So who knows, maybe sometimes the compiler duplicates and other times it misses the file out. The missing file problem did not happen today however. Quote: "I compiled the project and got a duplicated #constant error." Did you do a search to identify if there is a duplicate? Also, do you use the #include command? Quote: "When I look at the source code dump"
Which source code dump are you looking at (file name)? To me there are two. One that Indigo makes and sends to the compiler and the second would be one of the files that the compiler actually makes. I want to make sure we are referring to the same file. Quote: "Which source code dump are you looking at (file name)?" "FullSourceDump.dba" The one in the TEMP folder of the DBPRO installation path. I did not know about the one Indigo creates, so I will have to wait for the error to happen again to look at it. What is the file path for the one that Indigo makes? Quote: "Did you do a search to identify if there is a duplicate? Also, do you use the #include command?" Yeah I searched. The entire content of the files I mentioned where added twice in FullSourceDump.dba. The first line of the duplicated code was the #constant declaration, the first error detected was based on a declaration already declared. T$(T_PROTAGONIST_2_FNAME) = "Jones"	` Old welsh-english name often adopted by afro-carribean slaves; Rank 2 UK. Prof(SPORTS_PLAYER).Ids.Info$ = "A player with a skillset focused on participating in sports. Most of your character's career is based on improving skills and winning games in your chosen sports. This is the recommended profession for new players; or those who want to develop them best sports player available in the game." Prof(SPORTS_PLAYER_TECHNICIAN).Ids.Name$ = "Sports Player Technician"
Prof(SPORTS_PLAYER_TECHNICIAN).Ids.Info$ = "A player who participates in sports and who is responsible for obtaining, building, upgrading and maintaining technical equipment for the team. This is good for players who also want to create their own gear, and gear for the team. In campaign games." Prof(SPORTS_PLAYER_TECHNICIAN).Ids.Info$ = Prof(SPORTS_PLAYER_TECHNICIAN).Ids.Info$ + " Unlike regular technicians, player-technicians can race or play in sports. Unlike regular players, these players can build their own equipment." Prof(SPORTS_PLAYER_TECHNICIAN).Ids.Info$ = Prof(SPORTS_PLAYER_TECHNICIAN).Ids.Info$ + " In campaigns, players team up along side " + T$(T_PROTAGONIST_2_NAME) + " and " + T$(T_PROTAGONIST_3_NAME) + " to establish " + T$(T_PROTAGONIST_1_NAME) + "'s nearly formed team." Prof(SPORTS_PLAYER_COACH).Ids.Name$ = "Sports Player Coach"
Prof(SPORTS_PLAYER_COACH).Ids.Info$ = "A player who participates in sports and who also trains the skills of other players in the team and creates tactics based on the strategy created by the team manager." Prof(SPORTS_PLAYER_COACH).Ids.Info$ = Prof(SPORTS_PLAYER_COACH).Ids.Info$ + " Unlike regular players, player-coaches can level their own characters up to a higher level of ability without consulting another coach." Prof(SPORTS_PLAYER_MANAGER).Ids.Name$ = "Sports Player Manager"
Prof(SPORTS_PLAYER_MANAGER).Ids.Info$ = "A player who participates in sports and who also manages the team. A manager can be responsible for a number of requirements such as obtaining new players and picking tournaments. In campaign mode, managers work along side " + T$(T_PROTAGONIST_1_NAME) + " in order to help establish his newly formed team." Prof(SPORTS_PLAYER_MANAGER).Ids.Info$ = Prof(SPORTS_PLAYER_MANAGER).Ids.Info$ + " Player-managers get to experience the game on the field or the race in the driver seat; and can use this as an aid for making team decisions." Prof(SPORTS_TECNICIAN).Ids.Info$ = "The technicians focus on obtaining, building, upgrading and maintaining technical equipment for the team. They conduct research and obtain resources needed to do what they do best. During games or races, technicians provide technical support." Prof(SPORTS_TECNICIAN).Ids.Info$ = Prof(SPORTS_TECNICIAN).Ids.Info$ + " Having an exclusive skill tree, the tecnician is able to work with technology that is unavailable to player-technicians." Prof(SPORTS_COACH).Ids.Info$ = "The coaches work in training players in one or two sports. As the players gain experience they must level up through a coach. The abilities you provide will depend on your chosen avenue of expertise. Tactical coaches can also create tactics that boost players chance of winning by that providing more ingame actions." Prof(SPORTS_COACH).Ids.Info$ = Prof(SPORTS_COACH).Ids.Info$ + " Having an exclusive coaching skill tree, these characters can train unique skills that are known world wide or, can invent new skills exclusive to the character, only for his team members." Prof(SPORTS_COACH_TECNICIAN).Ids.Name$ = "Sports Coaching Technician"
Prof(SPORTS_COACH_TECNICIAN).Ids.Info$ = "The coaches work in training players in one or two sports. As the players gain experience they must level up through a coach. Coaches who obtain technician abilities can also build equipment based on their tactics." Prof(SPORTS_COACH_TECNICIAN).Ids.Info$ = Prof(SPORTS_COACH_TECNICIAN).Ids.Info$ + " A technical-coach can effectively train players to use special sports equipment, and modify the equipment to the player's needs at the same time." Prof(SPORTS_MANAGER).Ids.Info$ = "A manager uses his available actions to build up a squad containing teams for each sports in the " + T$(T_WORLD_CHAMPIONSHIP) + "s that the director chooses to participate in when in tournament mode. All sports are participated in when in campaign mode, but managers may choose one or more sports to focus their skill development on." Prof(SPORTS_MANAGER).Ids.Info$ = Prof(SPORTS_PLAYER_MANAGER).Ids.Info$ + " Using the exclusive managerial skill tree, special actions and bonuses are available to enhance the capabilities of the team. Managers are given a monthly budget by the team director, and can use the credits to buy new players, coaches and technicians." Prof(SPORTS_MANAGING_DIRECTOR).Ids.Name$ = "Sports Managing Director"
Prof(SPORTS_MANAGING_DIRECTOR).Ids.Info$ = T$(T_WORLD_CHAMPIONSHIP) + " squad directors create a squad of sports teams and designate a number of managers to run them. The director creates events, marketing programs and stadiums to generate cash flow to fund the teams." Prof(SPORTS_MANAGING_DIRECTOR).Ids.Info$ = Prof(SPORTS_MANAGING_DIRECTOR).Ids.Info$ + " The managing director also has the ability to manage a team or a number of teams in the squad, obtaining players or racers and forming tactics." Prof(SPORTS_DIRECTOR).Ids.Info$ = T$(T_WORLD_CHAMPIONSHIP) + " squad directors with the exclusive director skill tree have the can generate the greatest level of finances in the game. They create a squad of sports teams and designate a number of managers to run them. The director creates events, marketing programs and stadiums to generate cash flow to fund the teams." Prof(SPORTS_DIRECTOR).Ids.Info$ = Prof(SPORTS_MANAGING_DIRECTOR).Ids.Info$ + " The exclusive director skill tree provides special actions such as hire director, which enables the director to pass on some responsiblities to a manager, managing director or player manager." Only one entry of SF Character Text in there, and in the project file list in Indigo. I just caught this duplication bug too. I loaded my DBPro, removed 3 .DBA files, then re-added the same 3 files. Edited one of the #CONSTANTS within one of the 3 files, then compiled. Seems to think I have two of the same functions, but I don't. EDIT: And I can confirm the problem goes away after closing Indigo, opening Indigo then reloading my project. I noticed a couple of things from the examples. I see that the order of printing is also wrong. Did you happen to change the order or add/remove includes before trying to compile? Thank you for the report. It helps confirm that there is definitely an issue in Indigo. Helpfully combining the information from both will lead to a root cause. Quote: "I see that the order of printing is also wrong. Did you happen to change the order or add/remove includes before trying to compile?" I changed the order to how it is in the DBPRO file when the files where first created. The last thing I did was create a few new constants in the SF Text file. I will try to copy the Indigo source file when it happens again. It happens every 20-30 compiles. I have noticed an error that I have made in my own code; the name of the constant T_PROTAGONIST_1 is not a good one; this may cause the compiler to change occurances of T_PROTAGONIST_1_SNAME, but this did not happen because T_PROTAGONIST_1 was compiled after T_PROTAGONIST_1_SNAME. I will still change it to T_PROTAGONIST_1_FULLNAME to see if it is related to the problem. The last error message was "Failed to 'UnfoldFileDataConstants'". The last action was to hit save after creating and coding two new files. The compile order of the two new files where changed manually. Again, reloading the project, without having to close Indigo, prevents to the issue temporarily; I can compile and run the program with or without the change of constant names. I'm not able to actually reproduce what you describe. I would suggest using [tab] rather than [enter] when selected from auto-complete though. I found that using [enter] would just give me a new line. I will focus on the functions used to re-order includes. It most like is not clearing (or moving) data correctly. And this was next step anyway. It's only thing left that I can think of. v1.3.1 b3 has been posted. Corrected issues with the Cut/Copy/Paste buttons on the toolbar not working. As well as some other bug fixes. To include the issue that Chris Tate brought up about changing the include order and having duplicated code source when compiling. Come to find out it would only do it for me if I had the source open as well. Should be fixed now. I will download it in a day or so. I never noticed the copy and paste button issues; I use the keyboard for most tasks. So far almost so good. I've found the application crashes when the user right clicks and selects "Insert Keystate". But yeah, things are working so far. So much delicious functionality, I'm tempted to donate twice! Thank you for this great IDE. But can you insert a function to rescan the keywords? This makes it easier to write plugins. The one without constantly deleting the keyword list by hand. With Computers you can solve Problems that you have never befor. That should be easy enough. Expect to see it in the next beta. The error is easily dismissed, but is very repetitive making life tough. In my options file, I have the "Auto Complete Parenthesis" turned off too, although turning it on doesn't resolve this error. Sorry but I am unable to duplicate the error with the information provided. Lets talk this through in regular email. Looking good mate. Definitely giving this a good work out over the Christmas break. Happy new year Balid! Cheers for all of your efforts with your Indigo editor, you've both been fantastic! Thank you. Hope you and yours have a safe and Happy New Year. This is not strictly a fault but I have always been a programmer that likes to put many comments in my code. I have noticed that if I have beautify turned on to produce uppercase keywords then they are also 'beautified' in comments as well. This means that words like 'and', 'to', and many other innocuous words used in comments are transformed to upper-case. Can comment lines be left out of the 'beautify' process? I should have qualified my previous statement to say that it seems to occur only between Remstart and Remend comment blocks. I recently installed V1.3.1 Beta 4. 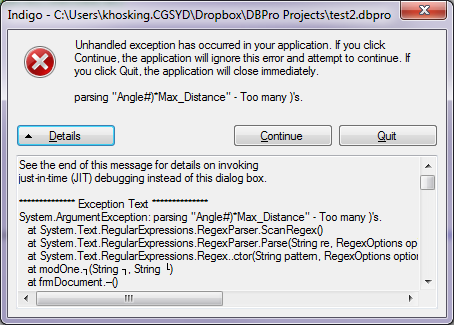 I open it up; save project file; save (blank) source file and then I get an error (see attached Image). Clicking continue allows me to carry on. I don't understand what's going on. The IDE is working wonderfully. Just a minor glitch so far; when a compiler error occurs, the IDE opens a new instance of the source file with the error line, but the file is already open. So for instance; if I make a mistake in a source file 1, after the compiler error; two instances of source file one are visible in the document tab, and you end up being taken to one of them. I am not sure why this happens. Thank you for the report. Those should be easy to address. Interesting. I'll have to do some testing. Could you post a screenshot? I just had a compiler error, but this time the problem did not occur. I will post a screenshot the next time it happens. Just a side note; the Replace tool replaces all occurances of text in all documents; even if 'Current Document' is selected. Edit: also on the following line; when I searched for 'offset#', it only found and highlighted the first offset word, when next was pressed, it did not highlight the second occurance. Not sure if this is what was intended. Here is a screenshot of the compiler error. The problem occurs after adding a new file to the project, saving it, then causing a compiler error; two instances of the source file end up open. I know this error. It occures if you add a new source file and work on it. If you add the source file it isn´t listed in the list of source files. You can easily fix this by reopening the project. Just hit CTRL+S and reopen the project from the list of recent projects under "File". Not really the best solution but it works this way XD. I had it myself many times but didn´t really bother to report it here, because it can be fixed so easily.